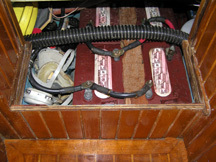 The heart of Rosie's electrical system is the battery bank. This has been well cared for but they have a limited life and I have to say it is nearing time for a replacing them. We have 8 Trojan 6 Volt golf cart batteries each has a 220Amp capacity. They are located under the floor below the NavStation and are accessed via the engine room and by lifting up the step down to the Quarter Berth. We connect them 2 in parallel to get to 12 Volts, (the Amp hrs on batteries in parallel is not added together) and then those in series it gives us a total of 880Amp hours. The Nigel Calder book on Boat Owners Maintenance, we call "The Bible" resides in a magazine rack in the salon has a great section on batteries but briefly. You should never go below 50% capacity without damaging the batteries and charging the last 10% takes so long it is typically not done hence the useable capacity of any bank is around 40% or in our case 350Amp hours. We have found Rosie to be perfectly set up in terms of required capacity and charging capacity. I recommend you replace the batteries before leaving for distant places however the batteries are adequate for another year if you are playing around the States. For example, with wind and solar to help with charging we rarely had to run the engine, currently after three hours of running the freezer the voltage hits my chosen lower limit of 12.2 volts and we have to recharge. If we use the freezer as just a fridge these batteries never need to be recharged since wind and solar keep up with day-to-day use. Just so you know, I have seen a steady decline over the 5 years we have had them and my book indicates replacing every 2 years is not unusual. The batteries are divided into two banks of 4 batteries each. However after much reading I decided it is better for the batteries and much more efficient and easier to charge if there is only one large bank. For this reason I keep the battery selector switch, located by the seat at the NavStation, set to Both. The only disadvantage to this is you could drain everything and not have a means of starting the engine. You would have to be very foolish or unlucky to drain 880 Amp hours, even then, a few hours of wind and or sun and you would be back in business. Never change the battery selector switch through the OFF position with the engine running you will blow the Alternator. Topping up the batteries is easily achieved via a funnel and a small hose (located in bathroom locker flush with counter top) and a mirror on a stick to see the level (take care not to short if metal mirror). See water maker for notes on making battery water. See Quad cycle for info on monitoring the battery bank. A hydrometer for testing the batteries is located in the NavStation Table.